He arrives on my doorstep wearing a backpack, which he never wears. He’s a notebook-and-pen type of person, everything else that you might carry in a backpack superfluous. I looked at myself in the mirror. Back then, I slept in a giant t-shirt. I took it off and then I shouted, “I’m FOUR!” And then I took off running, and made my Mom chase me. This morning, I looked in the mirror and thought I definitely felt older than 4, but I didn’t feel much older than 19. I wanted to run naked through the house, raising the eyebrows of my roommates (maybe not really, I run naked around the house quite a bit for a 20-year-old) and shout my age, but I didn’t. “Yes, I feel older,” I answer him. He unzips the backpack and takes out some giant headphones made of blue and white plastic, attached to his iPod. Then he takes out a black sleeping mask. I acquiesce. I giggle while he puts on the sleep mask. It’s a soft blackness – I feel him behind me and feel weirdly safe, weird because I know I shouldn’t feel safe when I can’t see. “Is it completely dark? Can’t see anything?” he asks. Once he drops my hand so that he can drive, he has given up talking to me. I feel him next to me anyway, I reach for his arm and he guides my hand to his bicep. I laugh a little while he flexes and unflexes it. Then I’m back into my seat and listening to his mix. It’s electronica I’ve never heard of, and then girl group pop from the sixties, which he knows is my favorite. I compare the 808 beats to the sounds of the echo-y drum kits from the past. When we met I didn’t know anyone at the party. I wandered out to the pool, which glowed in different colors thanks to some fancy lighting trick the host installed. I didn’t even know the host’s name, just my friend, and she had gone to find the boy she had a crush on. I wandered out into the backyard, and saw a nice-looking boy sitting on a beach chair, looking into the pool and hiding his mouth and chin inside a red plastic cup. “Are you okay?” I asked, sitting down on another beach chair. Two people jumped into the pool in their underwear, laughing and splashing us accidentally. “Sorry!” the couple said. Their cotton underwear matched. Blue stripes. We haven’t spent more than a couple days apart after that. He stands a little bit behind me with his arm guiding my arm and his other hand pushing at my waist. He holds my hand when we stop, and I can hear muddled voices. There are a lot of people here. They brush against me. I wonder how much they stop and stare. We start up again, and the electronic music gives way to female harmony and a four-four beat. I want to clap along, but he has my hand, so I’m just snapping with one hand down by my side. He takes off my headphones, then my blindfold, and I’m staring at dark blue and ethereal shapes. Jellyfish. Hundreds of them. It’s a riot of sight after the blackness of the sleeping mask. I can hear kids shouting and people bustling behind me, but I’m right up against the glass now, and I’m crying. I nod and wipe tears out of my eyes. I’m 20, my whole life ahead of me, and I don’t know if things can get any better than this. Posted on Saturday August 4th, 2012 Thursday March 5th, 2015 by Max Elman. 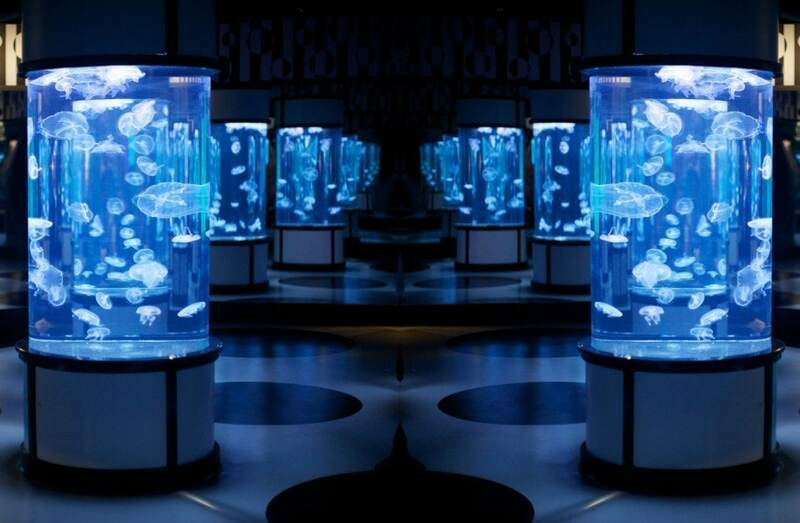 This entry was posted in German Translations by Sandra Kathe, Photos & Stories and tagged aquarium, jellyfish, surprise. Bookmark the permalink.